The most delicious-looking cakes on television. Call the Midwife, set in the poor neighborhood of Poplar in London’s East End starting in 1958, revolves around a group of young women and their nun-mentors at Nonnatus House, a nursing convent. The team attends the births of almost every baby born to the women of Poplar. In a line of work that is often stressful and marked by tragedy, the nurses still find time to celebrate, bond, and find comfort and friendship over cakes—which seem to always be hidden in a cupboard or freshly baked on the dinner table at the convent. The sixth season of the show premiered on April 2 and will run until May 21 on PBS. 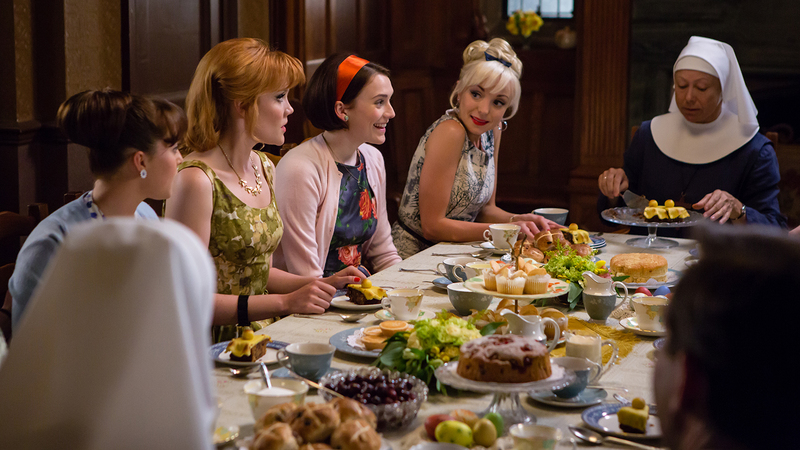 Here are 10 of the best cake moments from Call the Midwife. Jenny Lee arrives at Nonnatus House, a nursing convent, where she's greeted by the elderly Sister Monica Joan, who tells her, “I feel we are prompted to go in search of cake." Sister Monica Joan takes Jenny to kitchen, searching through the cupboards for cake until she comes upon a coconut layer cake hidden in a pot. She forces Jenny to eat several slices, but when Sister Julienne—the head of the order—arrives, Jenny realizes Sister Monica Joan stole the freshly baked cake that was intended for the entire house. Chummy, one of the nurses living at Nonnatus House, comes upon the convent’s handy man and grounds keeper, Fred, rummaging around the kitchen. He’s raising a pig named Evie in the convent’s garden, and it needs a snack. Chummy discovers half a Victoria sandwich—two layers of sponge cake with jam and cream layered between them—in a cake tin, which they give to Evie. Later, the pig goes into labor. When an abandoned baby turns up on the doorstep of Nonnatus House, the nurses must find his family. Appetites are undiminished even while the nurses discuss the baby’s future; in the midst of the debate Sister Evangelina demands a mince pie–a small pastry filled with dried fruit and spices. After a long nursing shift, Sister Evangelina and two of the nurses gossip at the kitchen table over slices of cake, but moments later their relaxing evening is shattered when they receive bad news about one of their comrades. Jenny takes a break from nursing at Nonnatus House after suffering a terrible personal tragedy. The midwives send her sponge cake filled with jam to cheer her up, but there’s a slice missing—Sister Monica Joan got her hands on it before it could be sent to Jenny. Yellow buttercream cake, another Victoria sandwich, and fruit pies make up the lavish spread for Fred’s engagement party for him and his second wife at Nonnatus house. When a surgical nurse living at Nonnatus House answers the office phone, she must support a woman who has gone into labor in her foyer until a midwife can get to her. That evening, the midwives celebrate her resourcefulness with a toast and a pink-frosted cake edged with raspberries. By this time, it’s 1961, and the social and cultural norms of the era permit that women can use birth control. The nurses gather with the local Dr. Turner, for a meeting to learn more about the contraceptive pill, which they hope to recommend to their patients. Before the meeting, Sister Monica Joan absconds with the plate of scones slathered in jam and butter intended for the group. At the height of the Cuban missile crisis, Fred advises the woman in town to paint their windows white to diminish the blast in the event of a nuclear attack. Sitting around their dinner table, the nurses anxiously await news. When they finally hear that the Russians have backed down, they celebrate the news with a strawberry layer cake.